No California Republican has voted in favor of a state budget proposal in years, so it was a little startling when one did on Monday. He may have been the most startled of all, because he wasn't really paying attention, as he later conceded on Twitter. In other words, while he was busy complaining about Assembly Bill 93 on Facebook, he accidentally voted in favor of it. It makes no difference for at least a couple of reasons. First, the California Legislature has been firmly controlled by the Democrats for some time—the Assembly, for example, is currently split 52-28. Because the GOP has no hope of prevailing on a budget vote, its members might as well vote against any budget if only so they can later say they did. But this budget bill would still have passed, of course, whether it got 53 votes or only 52. Second, because the floor vote is not actually the official vote—or, at least, because California allows lawmakers to go back and change the official record, as I would guess most legislatures do—Wilk's wayward vote officially never happened. 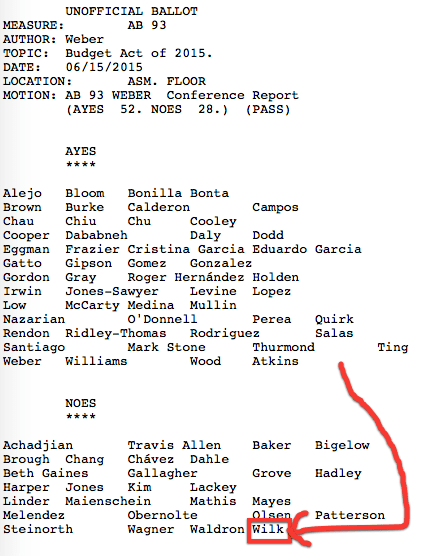 There doesn't seem to be any "interim" vote total (although it might be in the daily file somewhere), so for example even though this vote summary is captioned "UNOFFICIAL BALLOT," Wilk's vote is right there in the "NOES" section along with those of his colleagues. It is more difficult to stuff things down the memory hole than it used to be, of course. According to the report, Wilk changed his vote after the session ended, "receiving applause from fellow Republicans and boos from Democrats," all of whom were semi-pretending it mattered. Mrs. Wilk is right, of course, that her husband can't "multitask," because no one can. "The research is almost unanimous, which is very rare in social science, and it says that people who chronically multitask show an enormous range of deficits. They're basically terrible at all sorts of cognitive tasks, including multitasking." Clifford Nass (a Stanford psych professor) in "The Myth of Multitasking," NPR Science Friday (May 10, 2013); see "Mistrial Declared After Jurors Found Playing Sudoku," Lowering the Bar (June 10, 2008); see also Everyone Who Has Ever Texted While Driving, Everywhere (Anytime).